The Long Road to China: Sugar and "Spice"
This time of year, I usually begin to lose my "photo mojo". When the weather is warmer, I can get out and explore, but right now it is just too cold and it's difficult to stay inspired. So, I have been trying to find some fun things to shoot without having to brave the elements. While grocery shopping last week, I picked up some Valentine's Day candy. It is good to eat, but I thought it would also be fun to photograph. I loved the bright colors!! Saturday morning, I grabbed my camera and the goodies and headed for the kitchen table to set up. 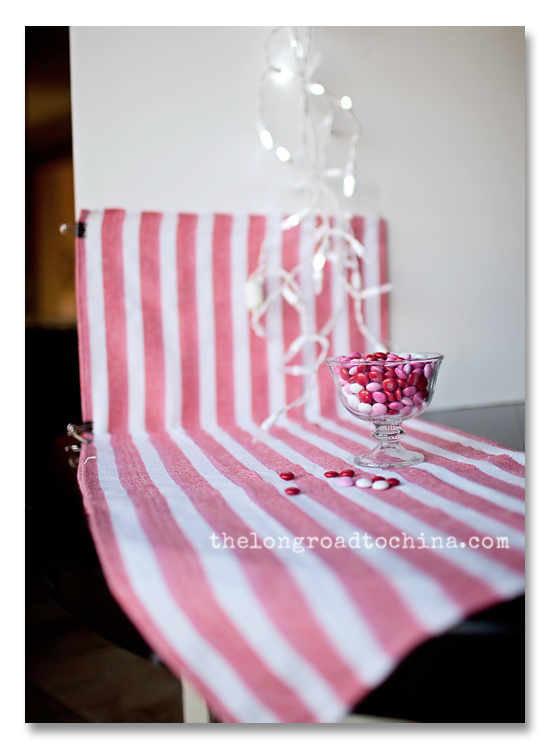 I get tired of seeing my kitchen table in every food or flower shot, so I have been using colored place mats, tea towels, fabric, or even wrapping paper to provide different backgrounds for my photos. In addition, for this photoshoot, I decided to bring out a string of Christmas Lights to add a little more interest! This is a poplar set up and I am sure many of you have already seen or even tried this, but for those that were wondering how to achieve this kind of look, I thought I would take a few steps back and photograph the entire set up. It was super simple. 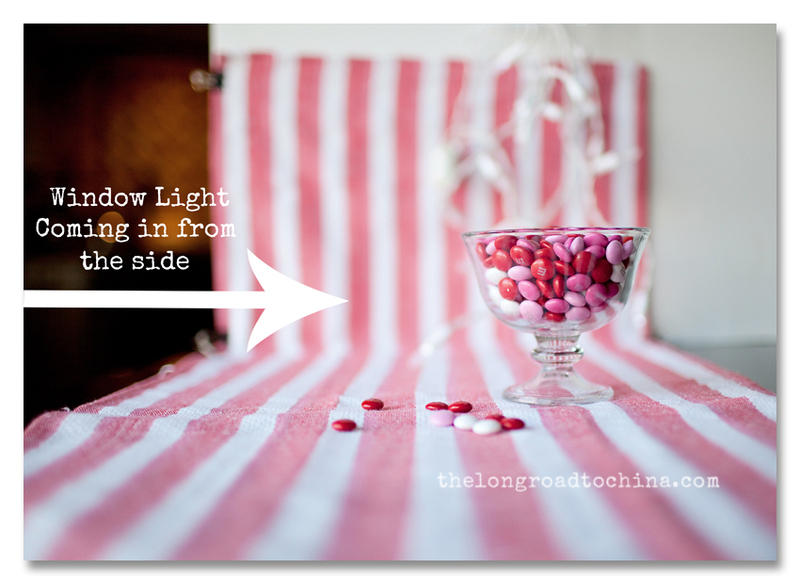 All you need is a table or flat surface near window light, a white board to clip or tape your fabric, a string of white lights, and your camera! I had to work quickly, because my "props" were disappearing..... one piece at a time! Pat lured the girls out of the kitchen(aka, my studio)and put a movie on in Sarah's bedroom, so when I was done "playing", I took them a little treat. I only brought one snack dish for the girls to share. When it comes to toys, she will share, but food, NO WAY!!! Would you look at the expression on this child's face? Even when sugar meets "spice" ....it always ends nice! This series of photos were taken a few minutes before the ones I posted on Sunday. I had to let Reagan consume quite a few of the candy hearts before I could get her to hold them in her hands without popping them into her mouth. Happy Wednesday Everyone..... We are halfway through the week!! 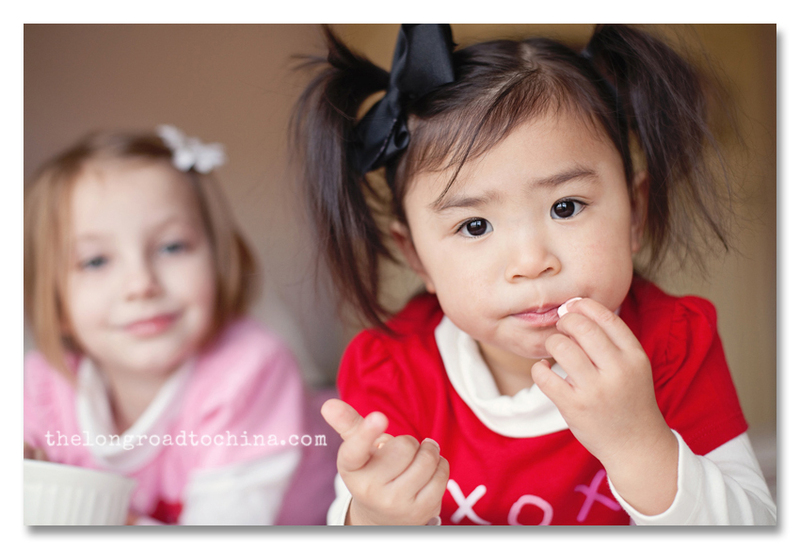 Super cute...my kiddos always love a "foodie" photo shoot. Happy Wednesday! I love the candy pics and I love Reagan's jeans! Too cute! oh my goodness did Reagan just grow up? She is looking more and more like a little girl. Great shots. Your girls are getting way too big way too fast. Don't they know they need to slow it down? Oh the expression on her face!!! I love it ! Thanks for sharing yor photo tips! The girls are super cute! That expression on R's face is hilarious!!! Fabulous as always, Lisa. Love how you showed your set up. I've thought of doing that too at times. Sarah's face is changing, she's looking more mature. Ugh, why do our kids have to grow up so fast? So beautiful....the girls and photos! Thanks for the details on the set up - so interesting to me. So cute!!! I would not be happy with someone eating MY candy either! Those two are adorable! So precious! 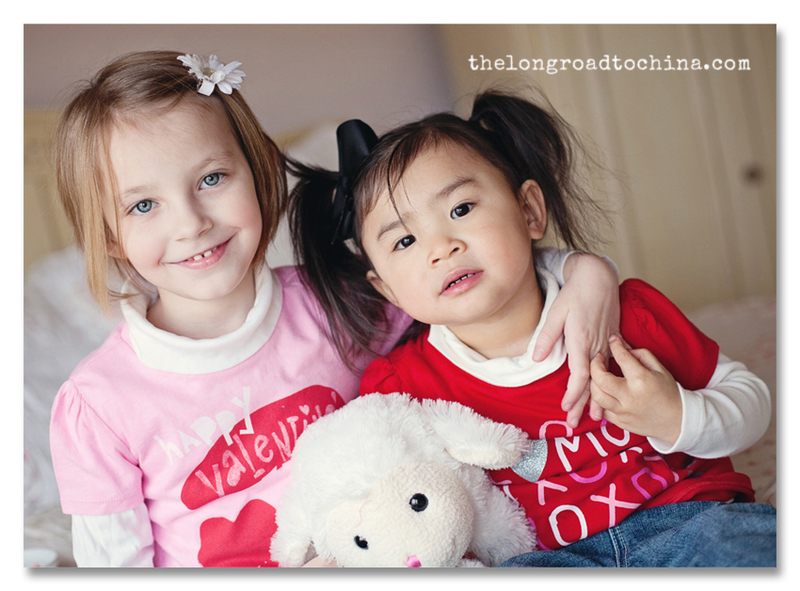 Such adorable kids, great photos...and red is my favorite color...so these photos are so festive to me. Great shoot! I hate to admit that I'm still stuck in my 'auto' rut. Ugh!!! We hit the best part of the course just as we lost all daylight during my hours at home. As the days are getting longer I'm finally hoping to have time to snap some pics out of auto mode and work through the kinks. Time to dig out my notes from November and give it a try!! Hey....here's a thought...maybe you could come up with a weekly post of your "tips and tricks" for all your "photog followers" and we could "link-up" and share or maybe start a FB page with a lesson of the week and share photo's of what we learned??? I so miss our "groups", sharing photo's with everyone and especially our AWESOME teacher!!! Lisa, your photos are superb! You're so generous to give out your tips, sharing is caring!!! I laughed so much at Reagan's face; she'll never be able to disguise her feelings, cos her face will tell all! Sarah is so good, and obviously kind and generous (where'd she get that from?! ), you can see her love for Reagan shining through here. She's great! Cute pictures! We don't like to share food either! I completely feel Reagan's pain! HA HA! I make mini studios like that too, especially during the winter. 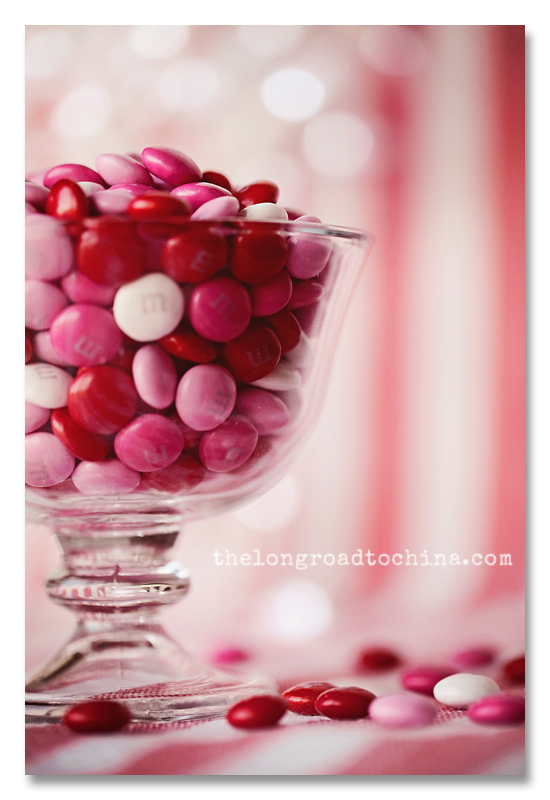 This Chenzhou mom has a candy eater...all things sweet! She's rocking those jeans. Love it! As for the candy- it looks SO GOOD. I love that look on Reagan's face- it pretty much sums up how I feel when I am forced to share my goodies. A girl after my own heart! Oh, I love this! I'd love to do it, but it would mean I'd have to move my kitchen table...don't know if I'm up for that! What a cute post! 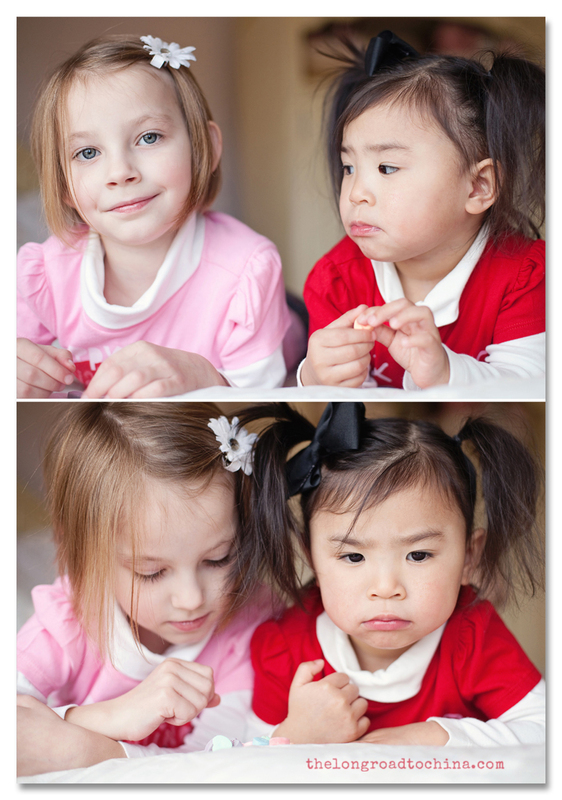 I just love Reagan's big eyes and expressions as she's "learning to share", right!!! Sarah looks like she's one patient big sister, good for her. Had to swing by after you peaked my curiosity about the light set up. It's funny b/c yesterday I dumped a bunch of candy out on my "kitchen" work station and did the same thing, using metallic colored paper. If I was thinking straight I would have proped up a board. But you're so right using color under glass give some great depth and interest. The bokeh from the lights are spectacular. I took an old green dish and put that behind the candy and had to work really fast, as yes, the props were falling on the floor, getting eaten by a certain candyholic(s) and well, as a stress relief after dinner (then why am I drinking veggie fruit smoothies lol). I'll show you my funky masterpiece on my blog. 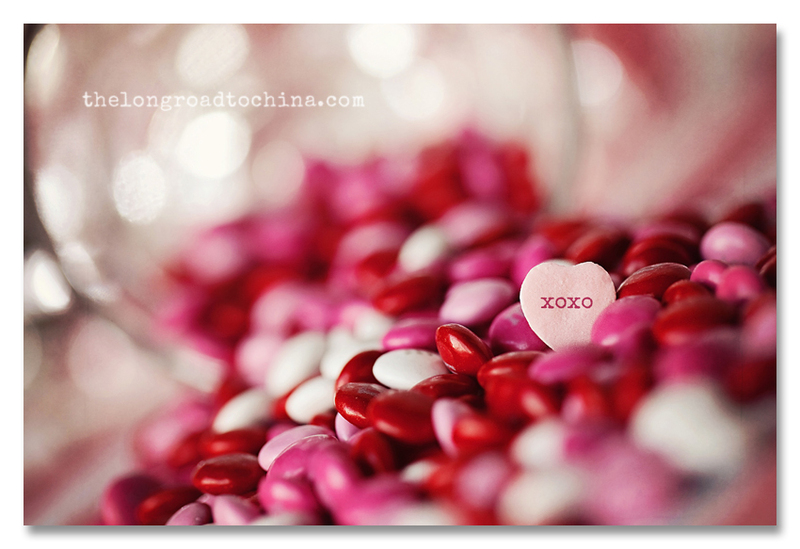 Thanks for sharing such a fun and interesting way to photograph chocolate! Yummy. I love your tutorials Lisa...and your pictures are always so inspiring to me. Thank you! !